"... This well-researched work is a call to positive action and self-rediscovery; especially for the young and still developing to clearly define their vision and mission in life and pursue same with the utmost vigour and focus; so as to be able to impact society positively and make the world a better place for all... Applying insights from this book, you can be the difference society or your immediate environment needs to make greater progress." Comr. Chris McCool Nwosu Publisher, Courage Quarterly and Social Commentator. Copyright © 2018 by Ndubuisi Precious Umebei. For more information about the author, write to the author from: preciousgold1212@gmail.com. All rights reserved. Except for use in any review, the reproduction or utilization of this work in whole or in part, in any form by any electronic, mechanical or other means, now known or hereafter invented, including xerography, photocopying and recording, or in any information storage or retrieval system, is forbidden without the written permission of the author or the publisher. CHAPTER EIGHT: ARE YOU THE PROBLEM OR SOLUTION? "This is a piece giving prior directives on how to adapt or perceive one's country and make better impact." "Many people are depressed, frustrated and stranded in life for lack of clear cut knowledge about their purpose in life. The lack of purpose makes life very uncomfortable and meaningless. You deserve better and can and will be the best. It is never late. This book, Make It Happen is a timely game changer and a classic key to unlock destinies. I recommend it to anybody who wants to make an impact in his or her generation. Enjoy a fantastic reading!" "Dear Hon. Ndubuisi Precious Umebei, having known your passion, drive and prowess in nation building through education development, I am optimistic that this book Make It Happen: Become a Solution to the World's Problems, is a great work that will help to increase the consciousness of citizens (readers) toward achieving a better Nigeria." "This book is a tremendous and significant guideline to a perfect understanding on how to cope and explore into being skilful and successful and creating absolute impact on the society at large. Happy Reading!" "As the name implies, Make It Happen is an objective book and practical oriented that gives good radiance in the mindset of Nigerians towards positive thoughts. It calls on us to think positively towards our dearnation to proffer solutions to the teeming challenges facing us as a nation through proactive activities and academic studies which is inline in rebuilding Nigeria. Make It Happen is highly recommended for all Nigerians, home and abroad and all works of life as it also looks into mitigation approaches to the challenges of sustainable development. A new Nigeria is possible through the contents of Make It Happen." "Nothing changes until our mind changes. The mindset we possess has a great effect in the way we act, speak and lead our lives. Ndubuisi Precious Umebei in his masterpiece, Make It Happen vividly outlines the importance of self-discovery and the keys to greatness. He also made a clarion call for a mindset transformation in the citizens so as to ensure a sustainable national development. I hereby recommend this masterpiece to all and sundry. We are the better Nigeria we crave for." 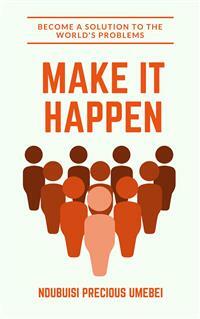 "Make It Happen is a book for everyone, young and aged. Written by a revolutionist, it convinces readers that it is indeed time to stop criticism and start acting. Chapter by chapter, the writer leads us into the realms of greatness and the power of discovering our purpose. Let’s make our world a better place. The time is now!" "I believe the contents of this book will bring a better future to the nation." "I was impressed with the concept, context and content of this book. It rekindled the often neglected fact that ‘leaders are the reflection of the society'. The book is an eye opener." "The author of this masterpiece has strenuously unmarked the possibilities and potentials innate in every human. He endears you as the reader to practically apply, in due time, all you might have grasped while taking a breath in reading these articulated thoughts." "Everything in this book encompasses the fact that Every Change Begins From You, Not Your Community. Therefore, it is a wakeup call to you, To Be the Change You Want to see." "Coming at a time our society is in dire need of solutions to myriad of problems, Ndubuisi Umebei's Make It Happen will equip you to take charge of your life and be the solution we all yearn for. The time is now; go out there and make it happen!" Complete life guide to greatness. This book has step by step tips on living an impactful life. A must read! Completely motivational! In the society where we have found ourselves, the young ones seem to doubt their ability to turn their dreams into reality. All you need to know in challenging your fears and bringing forth the fruit which you are planted to bear have been compiled in this life changing masterpiece-Make It Happen by Ndubuisi Precious Umebei. To young aspiring leaders, THIS IS A MUST READ! I dedicate this book to everyone who desires and is working for our nation’s transformation; together, we will make it happen! With a heart full of joy, I thank Almighty God for His grace, wisdom and enablement to write this book which is a tool for personal and national transformation. I thank my parents: Senior Evangelist Jude and Deaconess Rose Onyesikaidi Umebei. My siblings: Emmanuel, Collins, Esther, Joy and my relatives, you are the best family one can ever ask of. I will never forget to thank Sir Chris McCool Nwosu, Barr. Uche Ndumelu, Barr. Ifeanyi Ejiofor, Barr. Emeka Anyanechi, Snr. Deaconess Dr. C. Umeh, Fr. Udeke Charles, Fr. Akuakor Emeka, Fr. Anthony Ananwa, Uma Nina, Hon. Chris Azubogu, Anachuna Alvan, Dr. &Mrs. Chinwuba Anameje (Ozoigbondu), Favour Andrew, Obi Vina Sopuruchi, Whitney Humphrey, Obikwelu Mmadabuchi, Obidinani Emmanuel, Ubah Naomi, Sunday Precious, Mrs. Aladi Chika, Chinazaekpere Clara Sunday, Favour Dumebi Edeh,Ogwo David Emenike, Nwakanobi Paschal, all my friends and mentors, thank you for your amazing care, support and encouragement. I commend the management of Hinovelty, SpotLight Consult, Association of Young Nigeria Writers, the management and students of Jesus International Technical Secondary School, Umuezopi Oraifite, the leadership and members of Christ Holy Church International. I thank specially Hon. Barr. Ikenna Amechi Mbazulike and Engr. Ifeanyi Uzodike for their uncommon support. You are a blessing to me. I salute Mr. Godwin Chukwunenye Ezeemo (Achinagbaraoha) for his outstanding support of this project and vision, you are great soul sir. To Ifeanyi Enoch Onuoha, my brother, friend, mentor and role model, thank you for your selfless love and helping me grow into a better person. Thank you dear reader for purchasing a copy of this book, may the insights in it bless you greatly. I make bold to submit that the book “Make it Happen” should be every reader’s delight. What is more? From the very revealing introductory, ‘Save the day’, through the opening chapter ‘The great assignment’, to the last, ‘Are you the problem or the solution?’ -further broken into three inspiring segments, this young author powerfully provided success nuggets that challenge the imagination and / or docility of his reader. The key to unlocking the potentialities in the work is effectively and clinically couriered in chapter two under the title ‘Discover Yourself’.